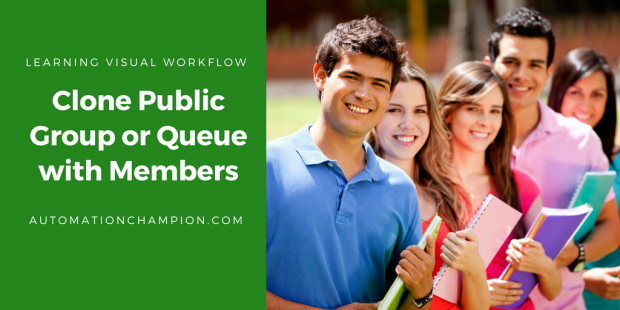 After Clone Chatter group with members article, I got lot’s of Emails/Messages from people wants to know about how they can clone “Public Group or Queue. Before going ahead I want to say big thanks to Mr. Mark Ross to feature my #Sp14FlowHackathon idea in his article. In this article, I will discuss how a Salesforce administrator can build an application using Flow to Clone Public Group or Queue. As a Salesforce admin many times you got the requirement to create one Public Group similar to existing group X (In our case we will say Public Group Sales Managers) and add few more users into it. Again this is the power of Visual Workflow, we will create an app without using a single line of code. Before proceeding ahead you have to understand Group and GroupMember objects in Salesforce. Group: – This Group object represents Queue and Public Group both. Groups are sets of users. A Group can contain individual users, other groups, the users in a particular role. By using Type field you can distinguish between Queue and Public Group. For Public Group (Use Type = Regular) and for Queue (Use Type = Queue). GroupMember: – Represents a User or Group that is a member of a public group. Note: – In this article, I will only discuss clone Public group. In the similar fashion, ou can develop a flow for the Queue. Note: – For Queue set Type = Queue and remove the field DoesIncludeBosses from Record Create element and add another field as per your choice. 10) Save the flow with name Clone Public Group or Queue and close the canvas. I will suggest you Implement this first on your developer org test it and then move it to Production.